Is it time to replace your old and outdated flooring? Shop for quality carpeting in Saint Charles, IL, and you’ll find great products at great values at our store. We are proud to carry one of the area’s largest flooring inventories. With countless materials and products to choose from, you are sure to find the ideal option for any room. From Berber to plush to frieze, we have all types of carpets in all colors and varieties. When it comes to carpeting, we offer the latest lines and fashions from the industry’s leading manufacturers – and all at affordable prices. Our in-store associates help you navigate our showroom for premium carpets that meet your needs, ensuring your shopping experience is easy and enjoyable. In a single short visit, you can walk away with the floors of your dreams. Sink your feet into something plush by choosing our store for carpet flooring. We offer carpeting products in many styles, colors, and materials. Simply choose what you want, and we’ll handle the rest. From removing the old flooring and prepping the surface to installing your new carpet, we do everything for you. You’ll always make the right decision by using our five-star selection system. Depending on your budget and needs, we help you choose the best carpet for your home or business. 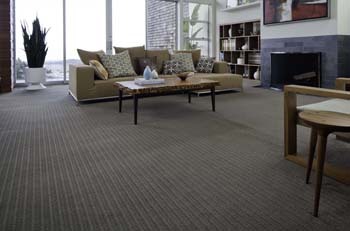 All of our carpets provide wall-to-wall beauty for any living area. Our 5-star selection system allows you see the various characteristic of each flooring type based on the rating. For decades, carpet has provided homes with unparalleled comfort and style. However, the products of years past haven’t always been able to stand the test of time. The modern carpets we carry now boast improved stain protection and wear resistance, making them perfect for even the busiest of families. From pet accidents to heavy foot traffic, our leading carpet lines are up to the challenges your household faces. Some carpet stores may pull the carpet out from under you once you walk in the doors. Not us. We specialize in personalized services, no-pressure sales, and upfront pricing on all of our carpeting. Best of all, we are more than simply a carpet showroom. Instead, our team takes the time to help you select the perfect product to suit. We then install it for you at your convenience. If after 30 days of your purchase, you find a lower price on the same carpet brand and style, we will refund the difference. We do this because we are proud of our products and services, but most importantly, we care about our customers. As a leading carpet dealer, we provide our clients with comprehensive installation services to ensure their flooring investment satisfies in all respects. To make sure your flooring fits just right, we complete free in-home measurements before beginning the carpet installation. After taking measurements of your rooms, our technicians then schedule a convenient time to come out and finish the job. Our knowledgeable installation professionals boast years of hands-on experience properly placing a wide range of flooring materials. They use the most trusted techniques and tools for the duration of the project, allowing you to start enjoying new and improved floors in a timely manner. Put something comfortable under your feet by shopping our flooring store for new carpets. Allow us to put something appealing under your feet. When you hire our skilled installers for carpet installation, we’ll never sweep your problems under the rug. Instead, we are very detailed oriented and proud about the services we provide. In fact, we actively strive for your complete satisfaction. We feature an Ultimate Confidence Guarantee for all of our customers. If you are not satisfied with your new 4-star or 5-star carpet for any reason, with 30 days after carpet installation, we will replace it for you. Contact us for a free consultation and estimate on the price of new carpets for your home. We proudly serve customers in St. Charles, Geneva, Batavia, North Aurora, and Wayne, Illinois, and surrounding communities.